Processing seems to have stopped. See screen shot attachment. Your attachment shows one image in the queue that is 4 days old. Is that what you think means the queue has stopped? Occasionally, an image fails to upload properly (corrupted?) from the user. 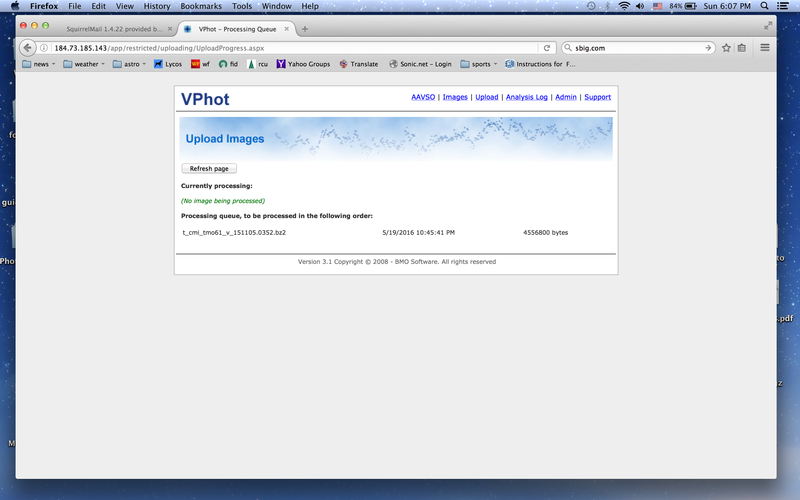 If this happens, VPhot cannot process the image and returns it to the queue for another try later. If it fails again it gets repeatedly returned to the queue and shows up as an old "stuck" image. To avoid this from giving "observant" users a false impression, George Silvis is updating his "cleanup" tool to remove such images in the future rather than depending on me (or you) to note them for manual removal. Yesterday, VPhot processed 960 images. I think it is operating normally but I'll keep an eye on it. Something odd was happening to me yesterday. At least twice I attempted to upload two images. Both had been plated solved by astronomy.net, and they both passed the upload wizard. When I checked the processing queue I saw what is shown in the screen shot. At least an hour later I went back to check the queue and got the same result shown in the screen shot. I would press the queue check refresh button, but nothing changed, and my uploaded images never appeared in my images list. That's what made me suspect the system was stuck. This morning I uploaded the same images. They're in the queue now. I'll contact you privately if there's a problem.